Believe in Separation of Church and State? Peeping through the cracks between the boards of the shed in our back yard, my brothers and I watched curiously as the small crowd gathered at our neighbors’ house. It was Sunday evening, and it wouldn’t be long before our mother called us in for baths. We had recently moved into the neighborhood, and we quickly discovered that one of the families next door had church services at their house where they spoke in tongues and handled poisonous snakes to demonstrate their faith. Even in the deepest heart of the Bible Belt, this family was an oddity. We couldn’t see inside the house once they closed the door, and our mom had forbidden us to go near the fence on that side of the yard when the services began. Terrified of snakes, we obeyed this rule without Mom’s usual threat of telling our dad when we disobeyed. And so we retreated to the shed on the other side of the yard, laughing and mimicking their moans, their hallelujahs, and the jerking movements of their limbs we had once glimpsed when they left the door open. I think of this family every year on Pentecost Sunday, and while the church of my childhood didn’t speak in tongues or handle snakes, there was plenty of shouting. The focus of that service was always on bringing sinners to repentance, so the pastor emphasized the violent wind and the tongues of fire, culminating in the threat of the sun turning to darkness and the moon to blood. I have since learned the history of Pentecost—that it wasn’t first a Christian observance but a Jewish one. 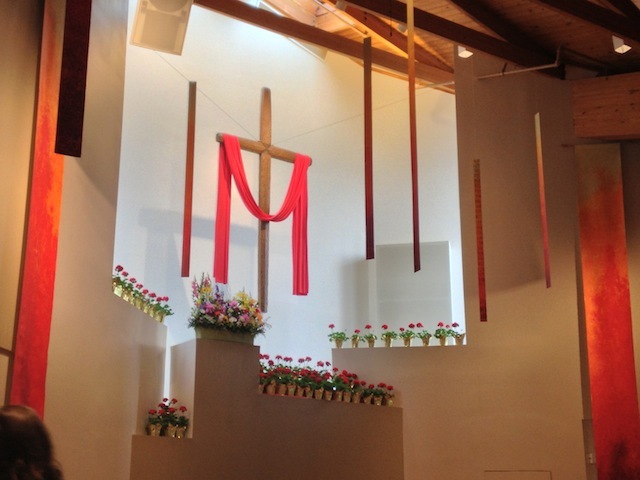 The church I attend now calls that Pentecost of the New Testament “the birthday of the Church.” The church is decorated with long fire-colored streamers that hang from the wooden rafters, a red scarf is draped around the cross, and the walls beneath the cross are decorated with red geraniums. The congregants dress in red and sing songs, and there is no sermon on Pentecost Sunday. The people in the pews are celebrating a birthday, and I go through the motions of joining them. But my own feelings about Pentecost were shaped long ago in a backyard that exists now only in my memory. And they were reinforced by a pastor who jumped up and down and waved his arm in the motion of an executioner’s scythe. While my own story may be at the utmost fringes of odd, I know from the stories others have told me that many of us struggle to deal with the scars left by those who taught us the religion of our parents. And when we see leaders in our country insisting that religion be brought into the arena of government, these are the people we see in our mind’s eye. This, I believe, is why the recent Pew Forum shows that the number of people who do not identify themselves with any religious group is steadily rising. And it’s why what’s happening in politics scares the hell out of me and a lot of other people. There is something different about conservative church leaders than the leaders in the churches of my youth. My science classes taught evolution; my church taught the Creation story. Nobody questioned that it should be otherwise. And while my views on faith have changed a lot since those days, I grew up believing that creation and evolution were compatible—that God was smart enough and big enough to create creatures who could change and evolve. Both my English teachers and my church leaders saw the seven days as symbolic of human understanding about time—something we humans could grasp when we couldn’t wrap our minds around the concept time immemorial. And while we said the Pledge of Allegiance every day, I don’t remember ever being told by a teacher to bow my head in prayer. My youth leader taught at my high school, and while she allowed those of us who wanted to do so to have Bible study in her room at lunch, she did not use her social studies classroom to proselytize. In fact, none of our social studies teachers ever mentioned God except in the factual study of the religions of the societies we studied. The only exception that stands out in my memory was the opening prayer and the benediction at graduations. This ritual rotated among the pastors in the town, and all the religions in the town were Protestant, so no one questioned the tradition. But the prayer was always for the graduates to be safe and to find their purpose in life, not for them repent and find salvation. Even the most extreme evangelicals I knew in my childhood honored the separation of church and state. I wonder now how the boundaries have become so blurred. Like those disciples on Pentecost, we all seem to be speaking different languages. But unlike those disciples, we don’t seem to be hearing and understanding each other. I believe it is possible—and far more productive—for individuals to allow their beliefs to inform their service to country without having to shout about them in the public arena. Even the most fervent evangelicals of my childhood seemed to believe that, and I’m thankful to them for giving me that gift. So can we make it work? Let us tell our stories, in all our different tongues, until the world begins to hear and understand. Previous PostThat Poor? Really?Next PostKids Say the Darnedest Things?